When the Indiana General Assembly convened for the first time in the new Statehouse on January 6, 1887, House Speaker Warren Sayre had high praise for the “magnificent structure.” Unfortunately, Harper’s Weekly did not share his rosy view of the nearly completed building. The following August, Harper’s published a scathing review of the Statehouse, blaming the “sad failure” of its architecture on penny-pinching legislators who “ruthlessly sacrificed” architectural effect in order to keep the project within its $2 million appropriation. 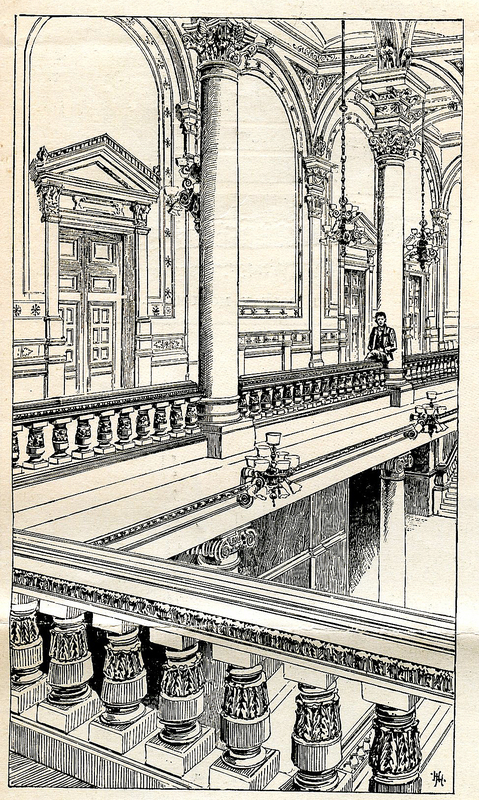 An illustration of the Statehouse corridor from Harper’s Weekly, August 11, 1888. It looks pretty much the same today. Notwithstanding the elevator situation, I love the Statehouse. Granted, I’m from Kokomo, where two of our most prominent public monuments are a giant sycamore tree stump and an enormous stuffed steer, but that just proves you don’t have to be a high-brow to find beauty in the Indiana Statehouse. It’s not some grandiose relic of over-the-top Victorian architecture. Instead, the Statehouse was built as an office building for government workers, a meeting hall for state lawmakers, a public space for all Hoosiers, and an inspiration to anyone who takes a minute to gaze down the marble-lined collonade to the soaring rotunda. It is both quietly simple and awesomely magnificent. Sadly, the man who designed this marvel never lived to see it built. Architect Edwin May died a few months before the dedication of the cornerstone on September 28, 1880. And although the old capitol had been crumbling since the Civil War, another eight years would pass before the completed building was dedicated. 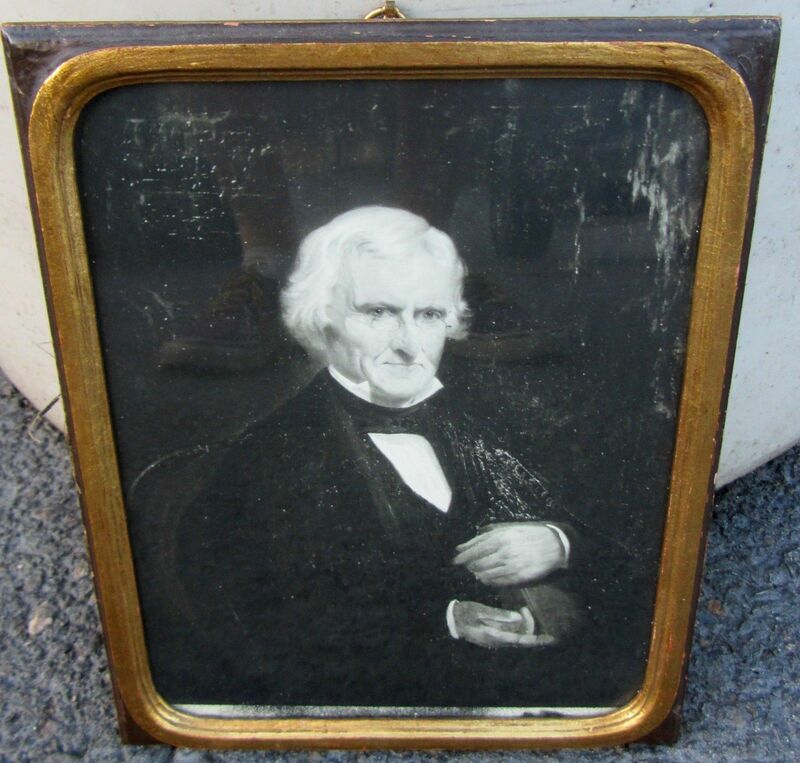 Two rare views of the 1835 Statehouse from the collection of David Yount. The stucco-clad Greek revival building stood at the south end of the present Statehouse grounds, facing Washington Street. 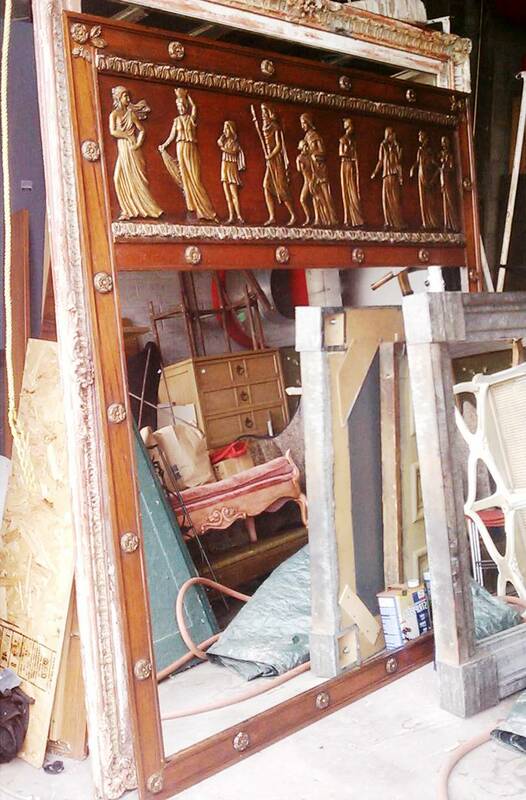 It was demolished in the late 1870s and hauled away for $250. Legislators started complaining about the shaky foundation and deteriorating stucco in the early 1860s, and the public finally realized that lawmakers weren’t playing Chicken Little when the ceiling collapsed in the House of Representatives in 1867. The legislature was out of session at the time and the damage was repaired, but the incident led to the creation in 1873 of a special legislative panel, the New Statehouse Committee. As part of its review, the committee decided to solicit plans from various architects. In late 1874, the field was narrowed to four finalists, including Charles Eppinghausen of Terre Haute and Elijah Myers of Detroit. Eppinghausen’s plan won with four votes, while Myers’ design was a distant runner-up with two votes. Although Detroit architect Elijah E. Myers failed repeatedly to win the Indiana Statehouse, he designed the state capitols for Colorado, Michigan and Texas (above), as well as the courthouse in Grant County, Indiana. The New Statehouse Committee submitted its final report to the legislature in January 1875, recommending construction of Eppinghausen’s design. The two dissenting members issued a minority report in support of Myers’ plan. After the legislature failed to act on either recommendation, Governor Conrad Baker chastised lawmakers, telling them that “[t]his house is neither suitable or safe for the transaction of the public business.” The General Assembly finally decided to delegate the task of selecting a design to a newly created Board of Commissioners, and on March 14, 1877, the legislature voted to construct a new capitol, requiring the building to be “in keeping with dignity of the State” and constructed at a cost not to exceed $2 million. The commissioners traveled to Lansing to meet with Myers and tour the Michigan statehouse. After taking additional junkets to view the capitols in Illinois and Connecticut, the panel took up consideration of the four designs named as finalists by the legislative study committee. Ultimately, all four were rejected as too costly, prompting the Commission to announce an open competition. Twenty-four designs for a new capitol were submitted to the Commission and reviewed by a panel of experts. In order to ensure an unbiased process, each design received a name selected by the competing architects, whose identities were not disclosed to the reviewers. The actual entries have not survived, but a brief description of each plan is published in the Commission’s report, along with comments from the reviewing panel. Edwin May’s winning design, as reproduced in a book commemorating the cornerstone dedication. As the commissioners were reviewing the designs, a scandal erupted that threatened to derail the project. In January 1878 the commissioners learned that Myers had received a letter from a person who claimed to have the authority to influence the Commission to select the Detroit architect’s plan. Although unsigned, the letter clearly bore the handwriting of Commission secretary W.C. Tarkington. The controversy deepened after allegations surfaced that Tarkington’s son-in-law had approached Myers on a train bound for Lansing and offered to influence the selection for $2,000. During a hearing on the charges, supporters of Tarkington maintained that it was a frame-up orchestrated by Myers, who had overhead the secretary saying that Myers’ stormy temperament and litigious reputation would make it impossible for the Commission to select his design for the new Statehouse. The commissioners were not swayed by this defense, and voted to dismiss Tarkington. A few days later, Edwin May of Indianapolis was selected as the winning architect for his plan dubbed “Lucidus Ordo,” which is Latin for “a clear arrangement.” May’s design received four votes, while a competing design named “Phoenix” received one. 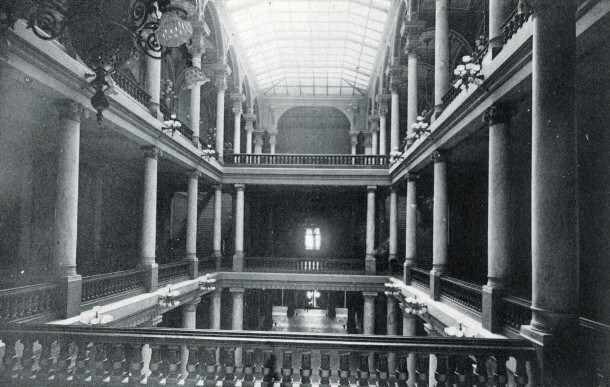 Although Phoenix may have been a more majestic design, with three domes instead of one, reviewers found fault with the multiple waterclosets placed around the main rotunda that intercepted the light, as well as the numerous lobbies that darkened the corridors. May had built a solid reputation as an architect for public buildings, designing the Northern Indiana Prison in Michigan City, the women’s building at the Hospital for the Insane in Indianapolis, and courthouses in Decatur, Allen, Knox and Hamilton counties. While the challenge of designing a state capitol may seem far removed from the task of designing a prison or insane asylum, during the 19th century the latter were built with beauty as well as utility, as citizens took great pride in the government’s investment in the rehabilitation of prisoners and care for the less fortunate. 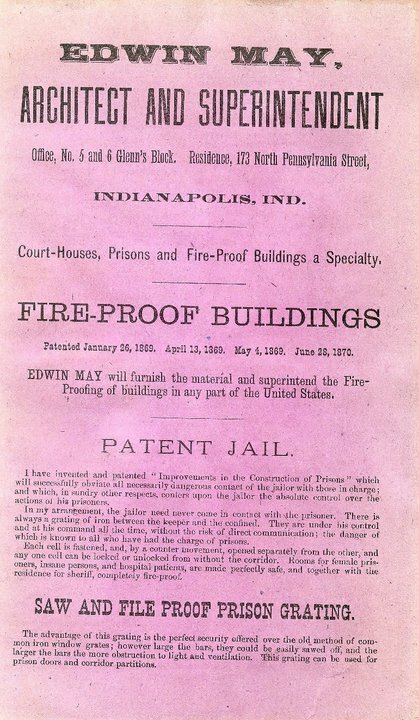 A one-page sheet from the early 1870s touting May’s expertise in jail design. Found at an antiquarian book show, where it had been disbound from an old business directory. The selection of May’s design on March 22, 1878 immediately set off a firestorm of litigation. The first lawsuit was filed on April 1 by political foe Samuel Tibbetts, followed the next day with a lawsuit from A.J. York, a Chicago architect who was one of the designers of the Palmer House. While both of these lawsuits were quickly dismissed through the efforts of my predecessors in the law firm of Faegre Baker Daniels (then known as Baker Hord & Hendricks), more trouble lay ahead when Elijah Myers decided to go on the warpath. Myers claimed in his lawsuit that the features of his design were incorporated into May’s plan by biased commissioners who favored the well-known local architect. A number of other local architects who had also failed to win the competition launched a media campaign in support of Myers’ lawsuit. An anonymous pamphlet aimed at discrediting the Commission and its selection process was distributed to all 150 members of the Indiana General Assembly. Around the same time, a number of subcontractors who had lost bids for construction began questioning the qualifications of the prime contractor and the quality of the materials. The House of Representatives launched a full investigation. In an attempt to discredit the Commission’s selection process, a group of disgruntled local architects circulated an anonymous pamphlet (right) to all 150 members of the legislature. 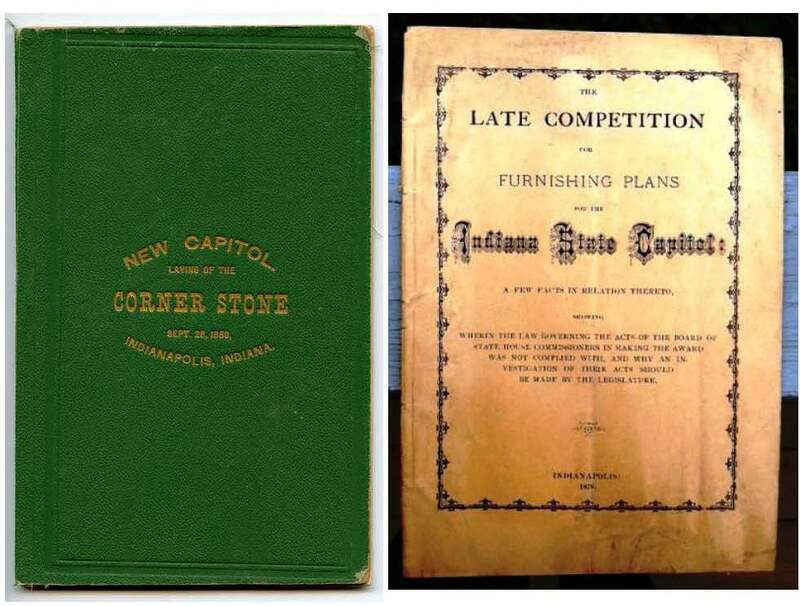 After the Commission was vindicated by the courts as well as by various legislative panels, it shot back by giving legislators a handsome memento of the cornerstone dedication. After receiving 1,600 pages of testimony, the House concluded in 1879 that the allegations were groundless. The following March, Myers lost his case. 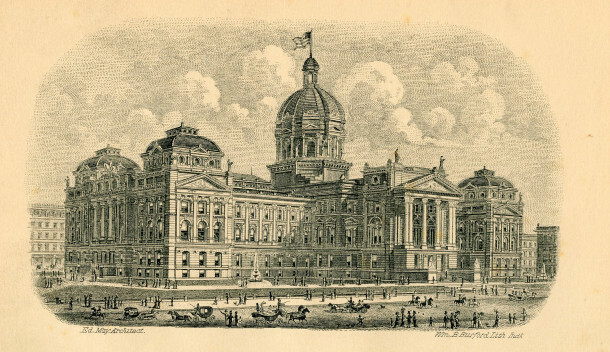 Construction on the Statehouse now was well underway, supervised by Adolph Scherrer, the architect tapped to replace May after his death in February 1880. 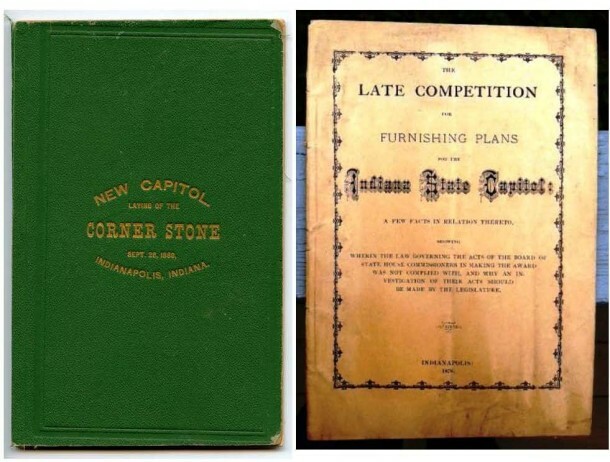 The cornerstone of the Statehouse was set on September 28, 1880 before a crowd of 6,000 people who were described by The Indianapolis News as “mostly ladies.” The program was both solemn and festive, featuring a lengthy oration by former Gov. 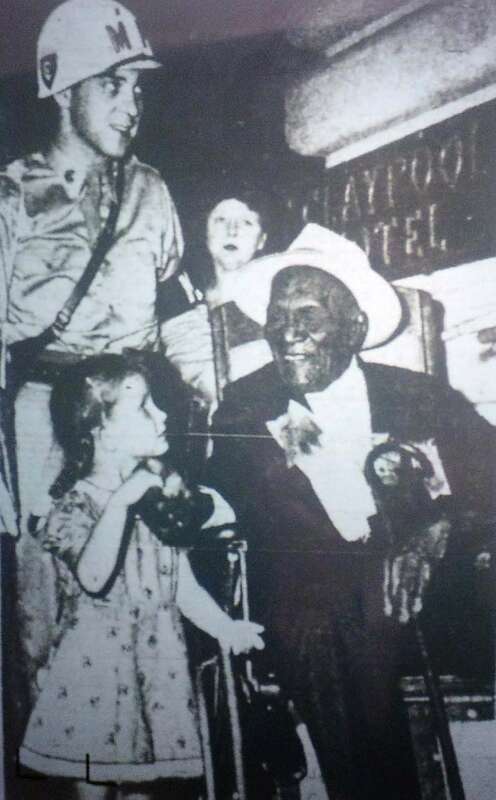 Thomas Hendricks, a poem by Sarah Bolton, and the playing of the Anvil Polka. Among the items deposited in the cornerstone were hermetically sealed tubes containing 47 different varieties of cereal and seed grown in Indiana and a copy of the 10 Commandments written in English and Greek and donated by the YMCA. 134 years later, Hendricks’ question still hangs in the air. But so far, so good. While the Statehouse has seen its fair share of “social convulsions” over the years, the worn marble columns that stretch from the floor to the dome have done a pretty good job of upholding the principles on which our government was built. Note: A version of this article first appeared in Historic Indianapolis in April 2012. I am taking a short break from writing Indianapolis Collected so I can focus on my work at the Statehouse as a lobbyist. (Click here to read about Indiana’s rich tradition of maligning what I presume is the world’s second oldest profession.) I will return to HI in April with new stories about Indianapolis history. And in the meantime, I’ll get to spend my days under the beautiful Statehouse dome, watching some modern history being made. The Statehouse as pictured in the final report of the Board of Commissioners. The spittoons lining the corridor have long since disappeared, but otherwise the Statehouse looks the same. Nice article! However, the “worn marble columns that stretch from the floor to the dome” might be one of the items that incited the wrath of Harper’s Weekly. Scagliola!